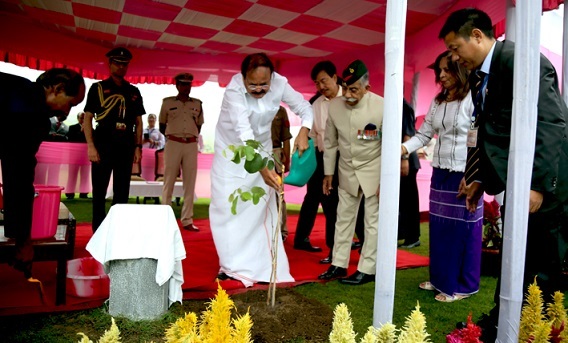 The Vice President of India M Venkaiah Naidu, on his maiden visit to Arunachal Pradesh planted a sapling of red sandalwood at the front lawn of the main building of Raj Bhavan, Itanagar on Saturday. Continuing the tradition of planting saplings by the visiting dignitaries, the Vice President planted ‘Rakta Chandana’. The Vice President was briefed by Governor BD Mishra regarding the plants, species, properties and usage. Red sandalwood is found in southern Eastern Ghats mountain range of South India and grown on shale sub-soil at an altitude of 750 metres. It is listed as Endangered Species by IUCN due to over exploitation. Its uses include antipyretic, anti inflammatory, anti-helmintic, tonic, hemorrhage and aphrodisiac. All officers and staff of the Raj Bhavan were present on the occasion. The Vice President was very gracious and offered a photo opportunity for the Raj Bhavan family. He appreciated the green and peaceful environment of Raj Bhavan. He advised the Raj Bhavan officials to keep up the sylvan surrounding of the Raj Bhavan. The Vice President was also appreciative of the rare weather beauty of the location, with eye soothing mist filled ambience. The Vice President profusely thanked the staff of the Raj Bhavan for their hospitality.